It’s that time of year again! The long-awaited football season is upon us. Teams get ready to storm the field, while fans get ready to storm the stands to cheer on their favorite team. Football has seen many changes since its inception and not surprisingly intellectual property has played a role in those changes as well. When a qualifying impact has been detected, the system uploads the data pertaining to the impact for access by the user or a third party and activates an indicator for notifying surrounding individuals that the user may have suffered from a concussion and needs to be evaluated. Hopefully, this technology will better detect concussions which can lead to early intervention and remedy some of the traumatic effects untreated concussions can have on a person. As any seasoned football spectator knows, hard metal seating benches can get uncomfortable quickly. Fortunately, Francis H. Chute invented a solution. 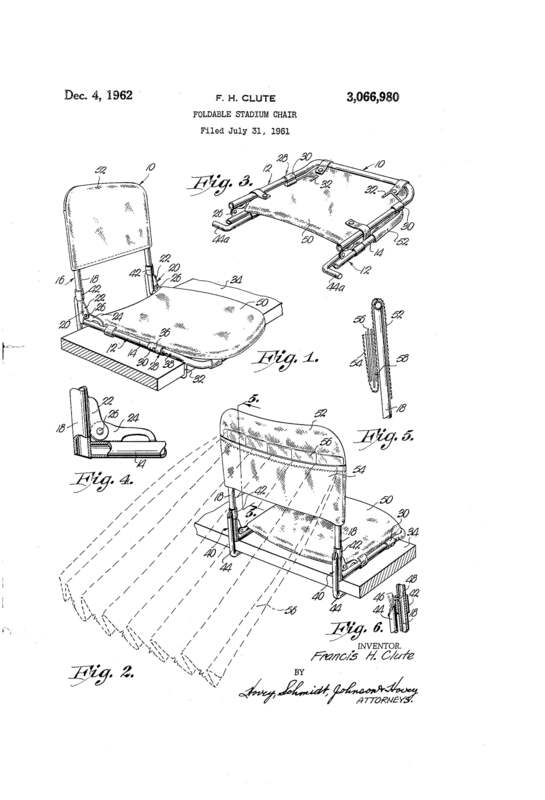 He created the “Foldable Stadium Chair” described in U.S Patent No. 3,066,980. This chair adds an element of comfort to the cold hard bench; it is ideal for all stadiums, it is foldable for easy transportation, has a locking mechanism to hold the chair in place, and clamps to keep the chair attached to the bleacher. This invention has allowed many to enjoy sporting events longer in addition to preventing many a sore backside. Not everyone can attend the games so many watch them on TV. 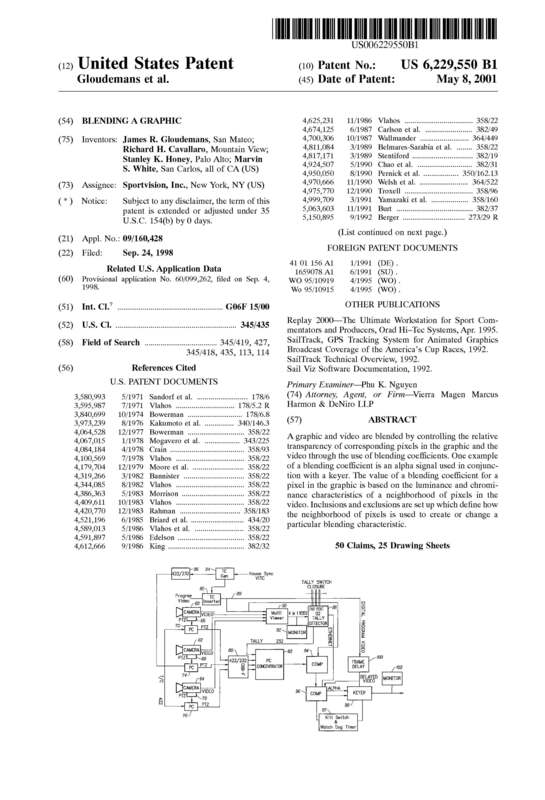 Before James R. Gloudemans, Richard H. Cavallaro, Stanley K. Honey, and Marvin S. White invented a system for “Blending a Graphic” as described in U.S. Patent No. 6,229,550, watching games on television was more difficult. Trying to determine where the ball was and which yard line it was on proved challenging. This invention lead to the display of the Virtual Yellow 1st & Ten® technology that depicts where the first down lines are during a game. This little yellow line has made it much easier to watch televised games as it shows the viewer where the team is and where they need to advance to in order to score or get a first down. For the doers instead of the watchers, U.S Patent No. 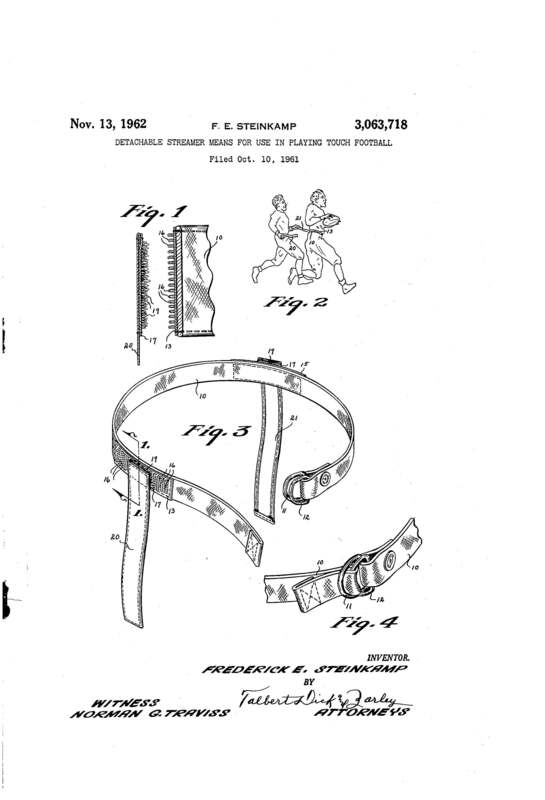 3,063,718 is the invention of “Detachable Streamer Means for Use In Playing Touch Football.” Invented in 1962, Frederick E. Steinkamp recognized that playing touch football was difficult because there was no way to determine whether a touch had been made or not. Others tried to solve this problem by attaching towels or handkerchiefs to player’s belts but that proved to be inconsistent because the detachable elements were not uniform. Steinkamp’s invention created a uniform detachable element. It is a belt with two flags, one on each side, which “have a plurality of closely associated rows of flexible resilient plastic broken loop hook members.” These detachable streamers are still used today by youth and adult flag-football teams. Innovation has improved all aspects of football, from watching to playing. 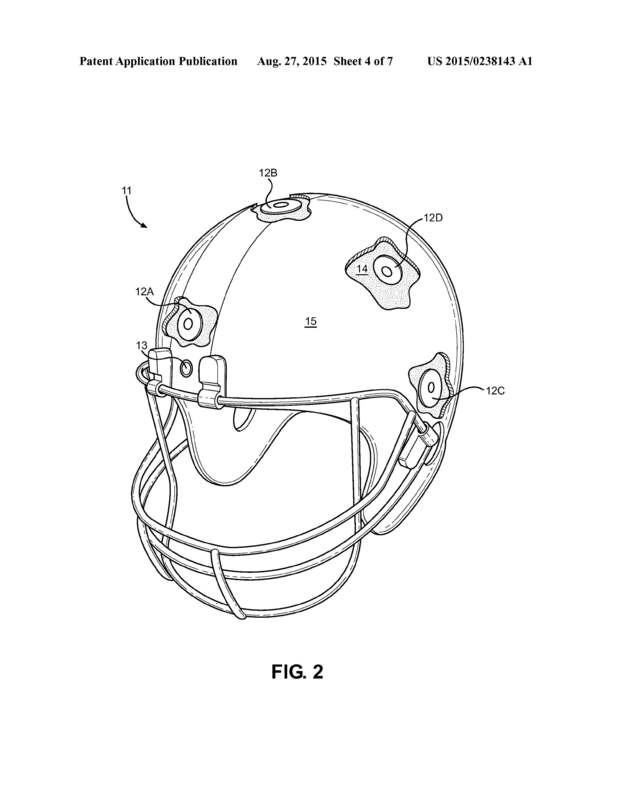 Without creative inventors, football would not be the sport we know and love today.